In her everyday life Eliza Mirk is shy, awkward and hates school, but in the online world she’s LadyConstellation, the anonymous creator of mega popular webcomic Monstrous Sea. Eliza can’t imagine ever enjoying the real world as much as the online one so she never really bothers to try. That is until Wallace Warland, Monstrous Sea’s biggest fanfiction author, transfers to Eliza’s school and, believing Eliza is just another fan, he begins to draw her out of her shell. But when Eliza’s secret is accidentally revealed everything in her life is thrown into turmoil, her relationship with Wallace, her art and even her sanity. I loved this book. I’ve been wary of books about fandom because I’ve always kind of felt that the first rule of fandom, is that you don’t talk about fandom. But I’m so happy that Eliza and Her Monsters showed me that there can be great books about fandom that respects and understands it. 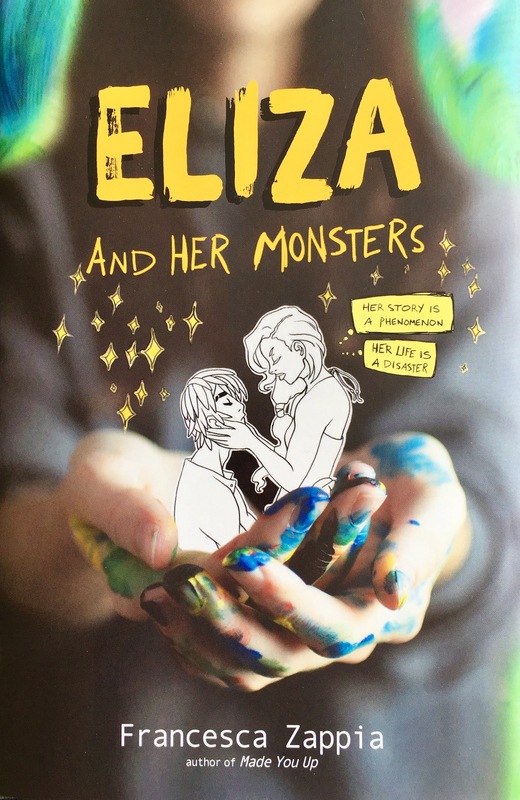 Eliza and Her Monsters is a mix-media novel, it includes panels from Monstrous Sea as well as emails, letters and instant messages. This, plus the fact the book is great, helps make Eliza and Her Monsters a really quick read. I loved how the extracts from Monstrous Sea often mirrored the situations Eliza found herself in, giving you an extra insight as to where her mind is at. The Monstrous Sea story was just as interesting as Eliza’s story and the book did a great job of explaining the plot of the webcomic enough that when characters discussed who their favourite characters were, you had a good idea who they were talking about. Eliza’s two best friends are Max and Emmie and they’ve never met face to face. I love how Eliza and Her Monsters shows how people behind a computer screen can be, and often are, just as important a connection as those you see in the flesh. The three of them are all great friends who not only share the fandom stuff but their real-life events too. I also liked how Eliza realises and apologises when she does sometimes takes Max and Emmie for granted, she’s a flawed, ordinary person who mistakes and I loved reading about her. I was on edge as the story progressed as I could tell that Eliza’s internet identity would come out and everything she had with Wallace would be put in jeopardy. I hate confrontation, both in real life and in fiction, and had grown so attached to Eliza that I didn’t want to see her hurt. I loved Eliza and Her Monsters. I loved how various characters grew on me as the story progressed, how I could relate to Eliza but still get frustrated with her sometimes, the complexities of online and offline personas – it was all so great. Eliza and Her Monsters made me cry because it hit me right in the feels and that hasn’t happened with a book for a long time. 5/5. Wonderfully written review! I just finished this book this morning and it was seriously UN-PUT-DOWNABLE. I love how original the plot was, I felt like I was reading a story within a story. I only had a problem with the ending. I loved Wallace up until the end. I feel as though he was being selfish and it was sooooooo not cool of him to hold Eliza responsible for his future, like, really? Serious jerk.